The Human Resources Department plans, coordinates and administers a comprehensive human resources management program for the City of Ontario and its employees. This includes the recruitment and retention of highly qualified employees, maintenance of a competitive employee compensation program, implementation and use of current technology for the City’s human resources information systems (HRIS), organizational and employee development, and employee/labor relations. Interested in choosing a career in public service to make a positive impact in the community? We invite you to consider a career with the City of Ontario by reviewing our current job openings. Interested applicants may also sign up to receive notifications regarding future job openings through our job interest card program. Additional information regarding employment with the City of Ontario and our hiring process is available by selecting the links located on the left side of this page. 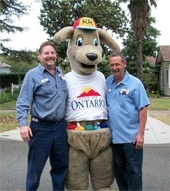 The City of Ontario is a dynamic leading community in the Inland Empire with a variety of full-time and part-time employment and volunteer opportunities. Ontario enjoys the reputation of being a progressive City which provides solid leadership to its citizens and to the business community. The City provides a full range of services to the community including; Police, Fire, Administrative Services, Community Services, Development, Economic Development, Housing and the Ontario Municipal Utilities Company. The City’s team is staffed with approximately 1,100 full-time and 200 part-time diverse and talented employees who work to support a common goal of providing excellent service to the community.